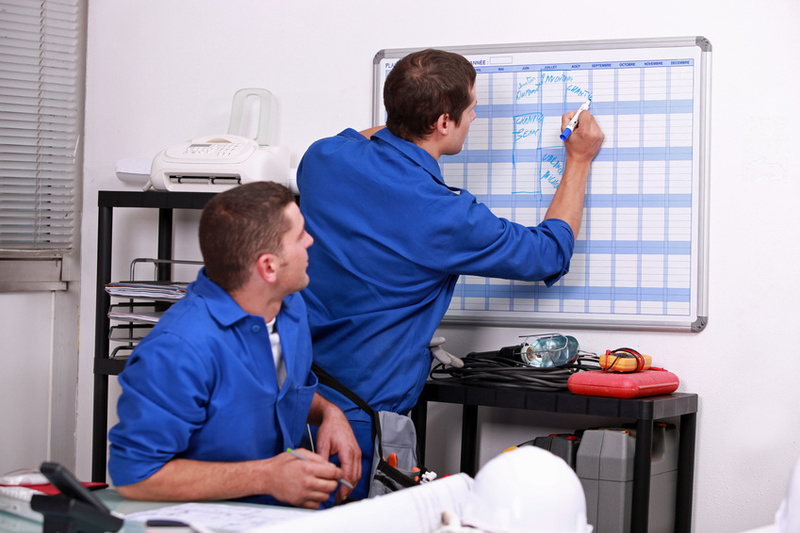 While Gantt charts are commonly used for production scheduling and project management, they still offer some unleashed potential for field service-savvy organizations. These organizations typically need to manage installs, service or repairs of systems or equipment. Hence, they send their teams of qualified service technicians into the field, i.e. to their customers. This blog post deals with the challenges to appropriately schedule all these valuable service engineers. 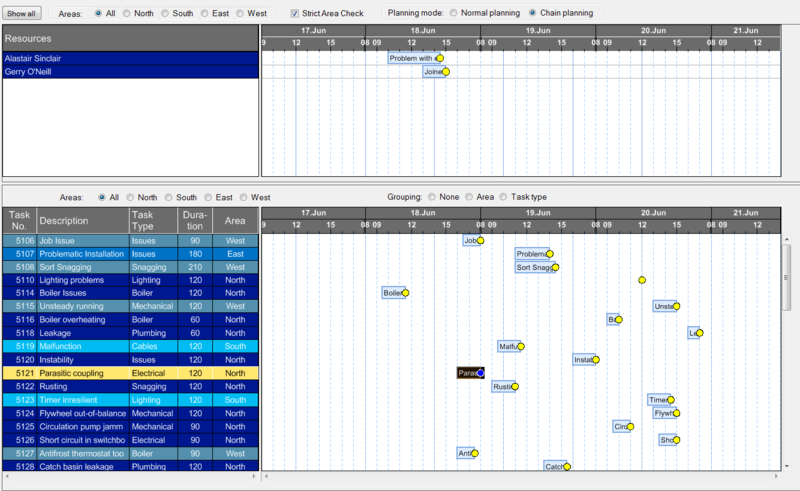 It provides ideas how interactive Gantt charts can add value to this scheduling challenge. It goes without saying that all service technicians are neither always nor on an ad-hoc basis available to comply with the current customer demand. At the same time, the shift and service staff planning needs to take into account constraints, availability, individual skills of technicians, and customer preferences. Nevertheless, especially in SMB organization, this entire scheduling challenge seems to be addressed in a merely manual way – by planners and dispatchers working with the telephone, whiteboard and “post its”. It shows all service orders including their due dates at one screen. It visualizes the service technicians, their availability and their current schedule. It takes into account calendar information, vacation periods, and other absence times. It allows intuitive drag & drop changes. This is especially the case, if it is built in a way that actually two Gantt charts are shown on the same screen: one representing the yet to be assigned service orders, and the other showing the actual service schedule of the respective technicians. This can kind of service Gantt chart can be seen from the screenshot. In order to create a service plan Gantt chart like this, field service organizations at least require the following information: Customer, customer location, duration to execute the service order, service order due date, description of task and priorities. It is also highly recommended having a field technician-specific calendar available, managing the standard working time, but also absence times like vacation, weekends, etc. In addition to this, many SMB service organizations keep good track of their technicians' skills and the skills required to perform a certain job. This information alongside with geospatial information (such as customer location and territory served by dedicated field technician) should get used to implement some Gantt chart specific business logic. 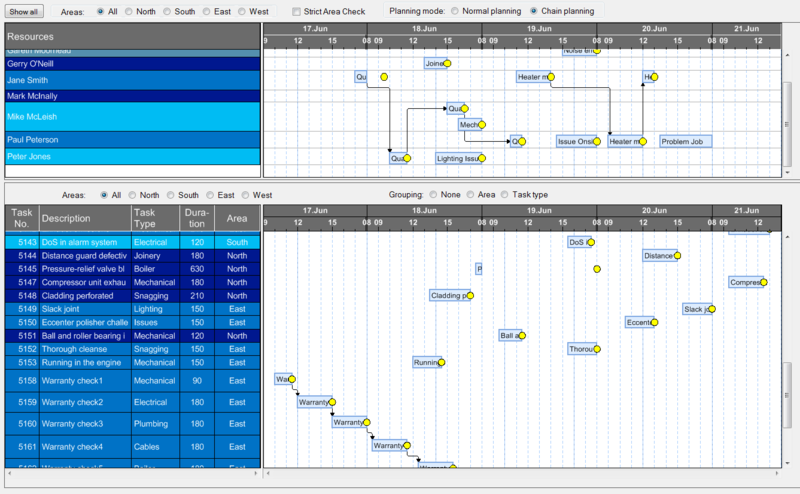 The next screenshot shows that a service order had been selected (lower Gantt chart). In the upper Gantt chart you then just see those service engineers who cover the region in which the customer is located and who have the required skills to perform the service job. Finally, it is recommended providing filter capabilities with the service plan Gantt chart. These could be filters by skills, location, status of service orders, date ranges, etc. Also, an intelligent solution should be capable of grouping service technicians e.g. according their skills, location or other criteria. This enables the dispatcher to understand the service schedule faster, and to better identify areas which require corrective actions. We offer a dispatch board for Microsoft Dynamics NAV, as an add-in solution. See how we visualize the service orders, backlog and resources in our Visual Service Scheduler. 10 graphical functions a planning board should offer might be useful for you.